Não. Nada tem a ver com o Super Mário, mas com a N64, e que se trata de um prego a fundo podem ter a certeza. Como o nome indica, cruza os Estados Unidos desde a Gate Bridge de San Francisco às Montanhas Appalachia, passando pelo Dakota do Sul. The goofy gameplay, amusing artistry, and spiffy soundtrack more than compensate for the game's cynical and depressing principles. Taken at face value, Cruis'n USA is a great little racer that, although short-lived, you'll keep coming back to time and time again. If you spend far too many hours thinking about and playing this title, you may discover the secret of life, or at least a headache. Just don't play the game on hard mode if your will-to-live meter is running low. Cruis'n's worth checking out for the nostalgia value alone, but be sure to rent this one first. It just doesn't have the staying power of a true champion. I also find it odd how the manual unfolds like a big poster. Was Nintendo trying to save money on staples? The game's soundtrack has been maligned in the past, but I don't mind it at all. The tunes have an understated quality, and the guitar-plucking "Deadwood Ride" is rather catchy. Cruis'n USA may not have lived up to expectations, but if you take it for what it is, you'll find this arcade racer to be quite an enjoyable trip. Malheureusement, il s'avère que la réalisation et le fun ne sont pas au rendez-vous du jeu développé par Midway. La maniabilité est douteuse, abaissant considérablement la jouabilité, les graphismes, sans plus et enfin, l'animation largement en deçà de ce que l'on espérait. Neben allen zuletzt erschienenen N64-Rennspielknallern sieht Cruis‘n USA wie eine Gokart-Simulation für Senioren aus. Auch technisch kratzt das Spiel den Konkurrenten keinen Lack mehr ab, dafür ist mittlerweile zuviel Entwicklerzeit im 64-Bit-Land verstrichen. Selbst das im allgemeinen recht abwechslungsreiche Streckendesign läßt keine wahre Freude aufkommen: Entweder rast man permanent gegen ein Hindernis und überschlägt sich unweigerlich oder langweilt sich auf monotonen Wüstenstrecken zu Tode. Schade nur, daß sich die damaligen Automatendesigner scheinbar wenig Mühe gegeben haben, um Cruis‘n USA den letzten Motivations-Schliff zu geben, was sich bei der Umsetzung fürchterlich rächt. Die unspektakuläre Grafikpräsentation mit unschönen Pop-Ups sorgt für weiteres Unverständnis. Kenner des veralteten Spielhallen-Originals und der zuletzt erschienenen Rasersimulationen werden für diese Vorstellung nur ein müdes Lächeln auf den Lippen haben. Leider sorgt Cruis‘n USA mit seiner simplen Steuerung und mangelnder Herausforderung nicht für die nötige Langzeitmotivation. Daher eignet sich dieses Rennspiel, wenn überhaupt, wohl eher für jüngere Zocker. Ultimately, Cruis'n USA is a dead conversion of a dead arcade game. Perhaps if Nintendo had waited to release a home version of the planned sequel, Cruis'n World (like they did with KI Gold, an enhanced version of Killer Instinct 2), this effort may have been worthwhile. Nach aktuellen Informationen will Nintendo Cruis'n USA nicht in Deutschland veröffentlichen. Grund ist die mangelnde Qualität. Richtig schlecht ist das Spiel zwar nicht, sondern höchst mittelmäßig, im Vergleich zu den Vorzeigerennspielen für die PlayStation stellt es aber keine gute Werbung für das N64 dar. As a straight port-over from the arcade, Cruis'n USA for the N64 leaves a bit to be desired. Gameplay is erratic using either analog or digital controls. Both cause the car to turn too sharply at high speed, especially when using Two-player Mode. Animation is adequate but seems dated by today's game standards. It certainly fails to show off the processing power of the N64. In addition, the two-player Split-screen Mode suffers from slowdown when things get congested. If all that weren't enough, the music is quite lame. In summary, this is not a great N64 racing game. It was an early release that was a quick and dirty port from the arcade. The controls are not great and it’s too easy to get knocked off the road for an arcade racer! It does have multiplayer – but only two players not four! I don’t really recommend it considering there are tons of other awesome N64 racing games including the two sequels to this game which are a ton of fun (to be reviewed in the future). As the first racing game for this fledgling system, Cruis'n USA is really nothing more than a poor copy of the arcade model. It's not a terrible game by any means; it's just rather bland. If you're dying for some high speed to throw into your N64, I'd advise saving your money. This one is a definite rental. Des véhicules plutôt mal dessinés, clipping très prononcés et des décors en carton pâte. Voilà ce qui vous attend, rayon graphismes. Côté environnement musical, une musique affreuse pour tout fond sonore, à la hauteur de la qualité musicale des meilleurs Boys Bands. Pour ce qui est de l'optimisation, les visuels sont plutôts inconsistants, la maniabilité laisse à désirer et la disposition des circuits est plutôt étrange. Le tout, avec une durée de vie légèrement supérieure à un épisode d'Hélène et les garçons. En bref, avec l'existence de jeu comme Top Gear Rally et MRC, ce jeu ne sera même pas considéré comme une nouveauté. Cruis'n USA se veut fun. Mais il est trop court. À réserver aux apprentis débutants. Despite Cruisin USA's inferior testimony, it is a million seller and is due atleast a rental before you go by some game reviewer's opinion. If you have never played the arcade version or never played a racing game at all, you just may like Cruisin USA for Nintendo 64. Heed my words, N64 players. Do not buy Cruis'n USA -- rent it, if you must. But be advised that almost every movie runs longer and offers more fun (and unlimited players) for the same money. Recommendation: Avoid at all costs. Imagine fast paced racing, graphics so sharp you almost can cut yourself, an amazing polygon game engine with no pop-up, accurate collision detection, fantastic music with memorable melodies and bass-pounding sound effects! 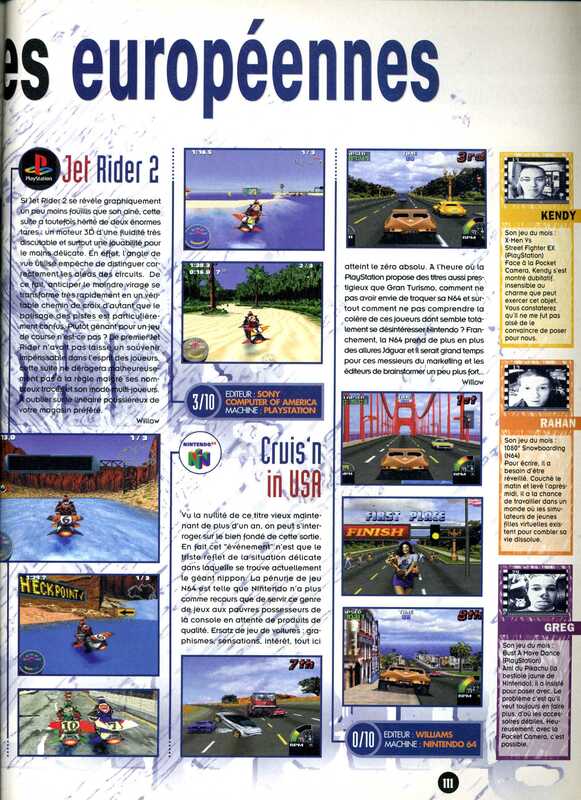 Cruis’n USA was never the game it should have been. Created by a team headed up by Eugene Jarvis – the legendary designer responsible for Defender – it pulled the crowds in the States as a coin-op, but never really caught on in Europe. The premise is sound (race around the US, visiting famous landmarks) but the N64 version has been more than two years in development and has lost a lot along the way. Alles in allem handelt es sich bei Cruis‘n USA um ein furchtbar armseliges Produkt, das nicht einmal einen Zehner wert ist. Das einzig Anregende an diesem Spiel ist die nette junge Dame, die Dir am Schluß die Siegestrophäe überreicht. Aber ob das allein schon den hohen Verkaufspreis rechtfertigt? Und was mich am meisten ärgert ist, daß auf diesem Produkt bereits das allseits bekannte offizielle Nintendo-Qualitätssiegel prangt. Welche Qualität ist hier gemeint? Sicher nicht die, die ich mir von einem brauchbaren Spiel erwarte. Gute Fahrt! Vu la nullité de ce titre vieux maintenant de plus d'un an, on peut s'interroger sur le bien fondé de cette sortie.